In the search for nutrient powerhouses, sprouts have emerged victorious! Recognised as the true ‘living food’ and ‘Nature’s boon to mankind’, sprouts have added value to our diet since ancient times. Sprouts exemplify the amazing way in which nature works at continuing life. We all know that when a plant produces seeds, it stores in them all the nutrients needed for the new plants to grow from them. These nutrients remain latent until germination occurs; and so, sprouting activates all these nutrients harnessing the full potential of the seed. 1. Easy to digest: Sprouting converts the complex nutrients stored in the seeds into a form that can be easily digested. In other words, the starch gets converted into simple sugars like glucose and fructose, proteins are broken down into amino acids and saturated fat gets converted into simple fatty acids. Sprouts also contain enzymes that aid digestion. In addition, sprouting destroys the seeds’ natural preservative enzymes that inhibit digestion. 2. Ideal for dieters: The calorie content of the seeds decrease on sprouting as some amount of the carbohydrates and fats get converted into more easily digestible forms. Sprouts are a good source of fibre that binds extra fat and throws it out of the body. Besides this, when had as a salad or breakfast, sprouts are very satiating, thereby keeping you away from impulsively snacking on high calorie foods. 3. Contains extra proteins: Sprouting increases the availability of proteins. For example, on sprouting, the protein content of moong increases by 30%, i.e., 100 gms of unsprouted moong contains 24.9 gms protein, but on sprouting it increases to 32 gms. The inactive enzymes present in the seeds also become active after sprouting thereby enabling easier digestion and absorption. 4. Provides a vitamin boost: On sprouting, the seed becomes a veritable nutrient factory with a greater concentration of Vitamin A, Vitamin C, Vitamin E, Vitamin K and B-complex. For example, wheat sprouts contain three times as much vitamin E as unsprouted wheat; lentil sprouts are an excellent source of vitamin C; and sprouted moong shows a dramatic increase in the amount of vitamins and minerals as shown in table. 5. Easy to absorb, enhanced mineral content: Sprouting helps stored minerals like Iron, Calcium and Potassium to be absorbed easily as they are converted to their simple form. 6. Fights diseases: Sprouting the seeds of Broccoli, Alfalfa and Brussels sprouts also increases the content of beneficial plant chemicals or compounds called phytochemicals, Antioxidants and bioflavonoids that help to prevent degenerative diseases like Cancer and Diabetes. The nutritive value of seeds increase manifold on sprouting. Since the data on the same is not available we have used the values of raw seeds to calculate the nutritive values of the low calorie recipes. • Grains like Wheat (gehun), Ragi/nachni (red millet), Bajra (black millet), Barley (jau), rye, Oats, Buckwheat, Horse gram (kulith), and Brown rice. • Seeds like alfalfa and methi (fenugreek). • Legumes like moong (whole green gram), chana (whole Bengal gram), Matki (moath beans), Hara vatana (dried green peas), Vaal (lima beans), and Red chana (black chick peas) etc. 1. Cleaning: Clean the seeds to remove any toxic chemicals. Remove any broken or damaged seeds before you begin the sprouting process. These seeds can rot and cause the sprouts to get an unpleasant smell. 2. Soaking: Soak the seeds in water overnight. Next morning, drain off the water and rinse the seeds until the water runs clear. Seeds should be moist, but keeping them immersed in water will cause them to rot, hence drain the water completely. 3. Sprouting: Spread the soaked seeds on a colander or a sieve and cover with a moist muslin/cotton cloth. Let the seeds sprout over a period of 8 to 16 hours (depending upon the seeds you use), refer to the table on for more information about different type of seeds. If the cloth seems dry, sprinkle some water over it. Moderate warmth, water and air are very essential for proper sprouting. Do not keep the soaked seeds closeted. Ideally, room temperature is ideal for growing sprouts. 4. Rinsing: Rinsing the sprouts twice a day ensures that they do not dry out and die. If you do not rinse, the sprouts will just become sour and useless even in cases where they don’t die! However, rinse the seeds delicately so as not to break the little shoots; once the sprouts begin to develop you might want to lightly shake them to remove excess water without breaking the shoots. Broken shoots will begin to rot or go mouldy, causing an unpleasant smell. However, you might find a slight, pungent smell coming from the sprouts. You need not worry about this, as it is just caused by the by-products being produced while growing sprouts. 5. Storing: When your sprouts have grown to the desired length, rinse them again, drain well and then put them in an airtight container and store in the refrigerator. Note: After the sprouts reach their peak, they immediately begin to lose the vitamin C content. So, don't attempt to store sprouts for longer than a week. Only grow small quantities of sprouts that can be used within a short period of time. 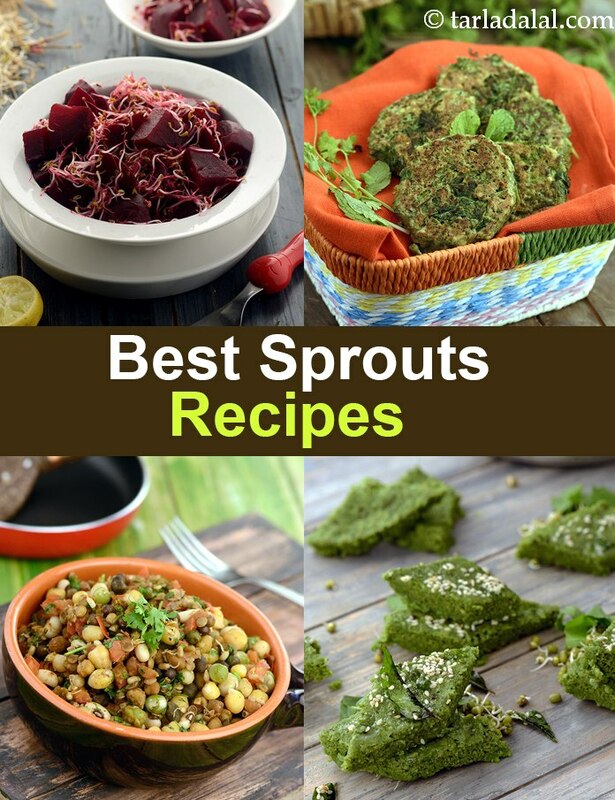 If you plan to consume sprouts on a regular basis to get substantial vitamins from them, it would be a good idea to have one or two small batches of sprouts growing all the time. Here are some quick facts such as soaking time, sprouting time, quantities required and cooking method, which will help you get started with sprouts! Matki (moath beans) ½ cup 8 to 10 hours 6-8 hours 2¼ cups Add ½ cup of water and pressure cook for 1 whistle. Vaal (lima beans) ½ cup Overnight 8-10 hours 1½ cups Add ¾ cup of water and pressure cook for 2 whistles. Chawli (cow peas/lobhia) ½ cup Overnight 8 to 10 hours 1½ cups Add ½ cup of water and pressure cook for 2 to 3 whistles. *Red chana (black chick peas) ½ cup Overnight 12 to 15 hours 1½ cups Add ¾ cup of water and pressure cook for 3 whistles. Hara vatana (dried green peas) ½ cup Overnight 12 to 15 hours 1½ cups Add ¾ cup of water and pressure cook for 4 to 5 whistles. * Kabuli chana (white chick peas) ½ cup Overnight 24 to 26 hours 1½ cups Add ¾ cup of water and pressure cook for 3 to 4 whistles. Safed vatana (dried white peas ½ cup Overnight 24 to 26 hours 1¼ cups Add ¾ cup of water and pressure cook for 3 to 4 whistles. *Rajma (kidney beans) Big/Small variety ½ cup Overnight 24 to 26 hours 1¼ cups Add ¾ cup of water and pressure cook for 3 to 4 whistles. Moong (whole green gram) ½ cup 8 to 10 hours 6-8 hours 1½ cups Add ¾ cup of water and boil till cooked and all the water is evaporated. Fenugreek (methi) seeds ½ cup Overnight 6-8 hours 1½ cups Add ¾ cup of water and boil till cooked and all the water is evaporated. Masoor (whole red lentil) ½ cup Overnight 10 to 12 hours 1½ cups Add ¾ cup of water and pressure cook for 2 to 3 whistles. Wheat (gehun) ½ cup Overnight 12 to 14 hours 1½ cups Add 1 cup of water and pressure cook for 3 to 4 whistles. Kulith (Horse gram) ½ cup Overnight 10 to 12 hours 1½ cups Add ¾ cup of water and pressure cook for 2 to 3 whistles. Mixed sprouts (red chana, chawli, moong, rajma etc.) ¼ cup Overnight 10 to 12 hours ¾ cup Add ¾ cup of water and pressure cook for 3 to 4 whistles. * These pulses are slightly difficult to sprout as they take longer and release some foul smelling compounds hence take utmost care while sprouting them at home. Ensure you rinse them in between to remove the foul smell and discard the spoilt seeds if any. There are certain sprouts like alfalfa and Chinese bean sprouts etc, which are neither easy nor economical to sprout at home; hence it is advisable to buy these readymade from the market.